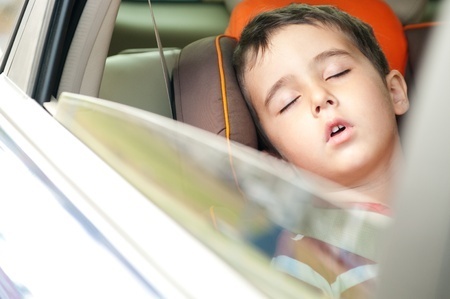 Plan to hit the road when kids are ready for a nap or at night. planning for meals and potty breaks and more can help pave the way for a smooth drive ahead. With these tips for road trips, you might actually look forward to the road trip this time. No, not that kind of family planning. It's a little late for that. We're talking family planning tips for road trips here. This is the kind where you and the kids look at the map and talk about about how long the trip will take, and what kinds of interesting things there might be to see and do on the way. Try to schedule at least one fun stop for each day of the trip. And let each kid pick at least one of the attractions. For kids, there is something wonderfully wicked about jumping into the car in the middle of the night. Wow! Up past bedtime and headed for adventure! The good news is that they are also headed for sleepy time and you're headed for at least eight hours of driving without whining or fighting. Each kid needs his own blanket and pillow. Consider an electric car blanket for long trips during the cooler seasons. Cotton blankets and other soft blankets are also a good choice, along with a neck pillow. Encourage kids to dress either in PJs or sweatpants and T-shirts. Or something with an elastic or tie waist. This is a lengthy drive, after all, not a quick jaunt to the market. Riding in the car is tedious. (Remember?) Have each kid pack a mobile entertainment kit with books, CDs, iPods, puzzles - whatever they will enjoy and that will fit in the backpack. When it comes to road food, look for picnic areas where you can enjoy a deli meal while they run around, let off steam, and act like kids. Or, try fast food places with playgrounds attached or pizza parlors disguised as amusement centers (think Chuck E Cheese). No, it may not be fine dining. But you may keep your sanity. Unsure if eating in the car is a good thing for your family? See Dashboard Dining: Yes or No? Wrap some inexpensive surprises as presents for good little riders. If the kids aren't fighting or whining, they get to open a gift every 100 or 200 miles (depending on how long your trip is). Also, give the children a small amount of money to spend (blow?) when you stop at restaurants with stores attached. If the plastic shark amuses little Dalton for the next 50 miles, it's worth the 99 cents. 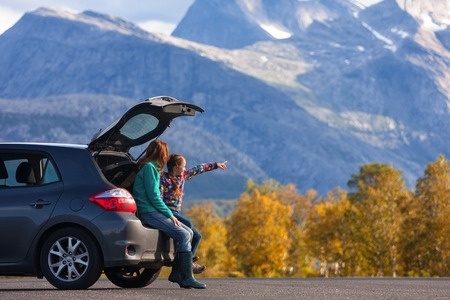 Adventure is the name of the game on a family road trip - so don't let a tight schedule prevent scenic stops. Remember that getting there is part of the family fun. If the kids see signs for a Petrified Forest, stop and see what it is. One of my friend's daughter's most memorable side trips was when she managed to persuade her goal-oriented mother to stop the car at the Donner Museum on the way to Lake Tahoe (she was studying the Donner party in school). The family enjoyed the museum almost as much as their ski vacation. Plan to use road time to actually talk with your kids; and actually listen to what they have to say. Look at the sights you pass and discuss them. Yes, there are stores along the way. But none will be within 30 miles when Ashley throws up on herself. You'll need bottled water, paper towels, extra clothes, medications, a first aid kit and the aforementioned toilet paper and seat covers. Have a great trip!